A neutral sofa and pale walls create a soothing backdrop in this exotic living room, while zigzag patterns and woven fabrics warm up the look and inject a touch of global-chic. Mix plain and patterned cushions for a look that isn’t too ‘done’ and opt for rich wooden furniture to add extra warmth. 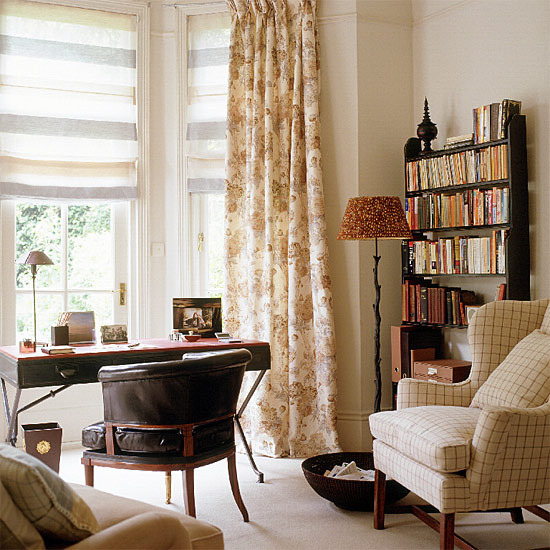 On large areas like curtains, swap zigzags for softer wave patterns to keep the scheme calm. 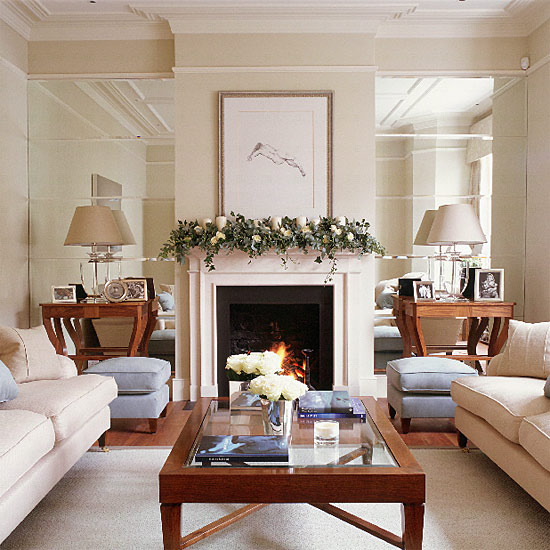 Mirrored alcoves on either side of a classic Chesney fireplace create a pleasing sense of symmetry and space in this elegant living room. 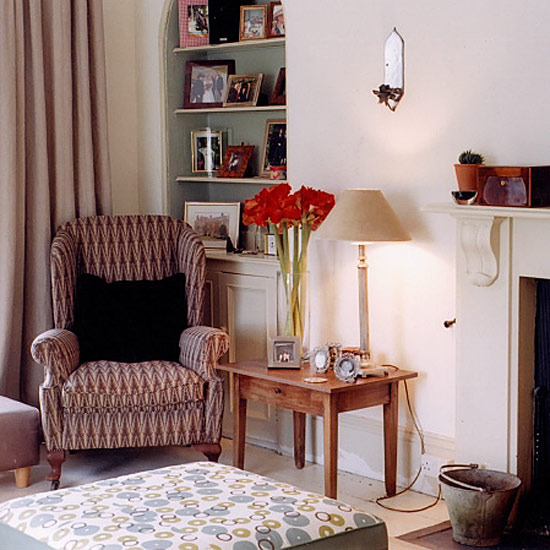 The symmetry is continued in the matching wooden sidetables with lamps and framed photos, and smart padded footstools. A coffee table leads the eye to the fireplace. The stylish sofas are by Helen Green Design. Silver patterned wallpaper adds a touch of shimmer to this luxurious living room, and is complemented with warm cream furniture and golden accessories. The dark-wood bookshelf adds definition to the neutral colour palette as well as bringing life to the corner of the scheme. Mix-and-match striped cushions are a great way to liven up a sofa. Pretty classic-style pieces and restful shades of sage, taupe and chalky white create a traditional feel in this living room. Natural flooring introduces a country touch, while vintage-style accessories add decorative detail to the fireplace. Teak and walnut tones add depth to the scheme. 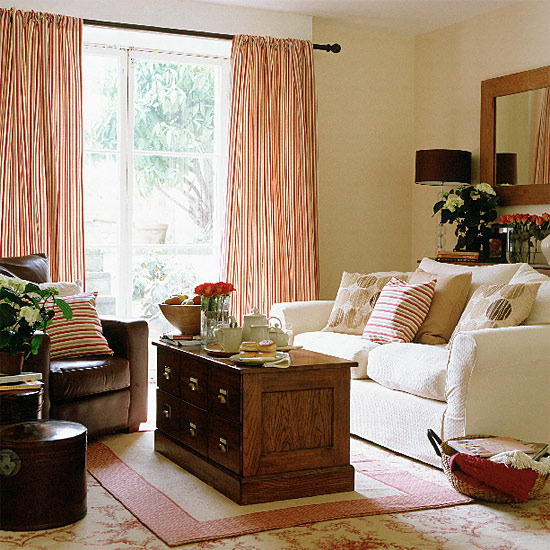 An Elverdon plaid sofa in pinks and browns is warm and inviting in this traditional living room. Add cushions in different designs by Eleanor Pritchard, a Susannah Hunter leather screen and a Zebra lampshade with twisted stand from Neisha Crosland to complete the look. A contemporary armoire in this living room, lined with Grasscloth wallpaper from Altfied, helps to frame the space and draws the eye towards the Valerie Wade Art Deco mirror and classic fireplace. The leather coffee table from Louise Bradley adds a modern twist. Floor-to-ceiling storage, comfy chairs, a small side table and floor lamp create a decicated area for relaxed reading in this living room. A comfortable button-back armchair from Graham and Green and soft lighting creates the perfect reading corner in a living room. Here, a shimmery metallic shade from Liberty with a stylised pattern updates the classic drum on a standard lamp, while the tripod stand makes a dramatic base. 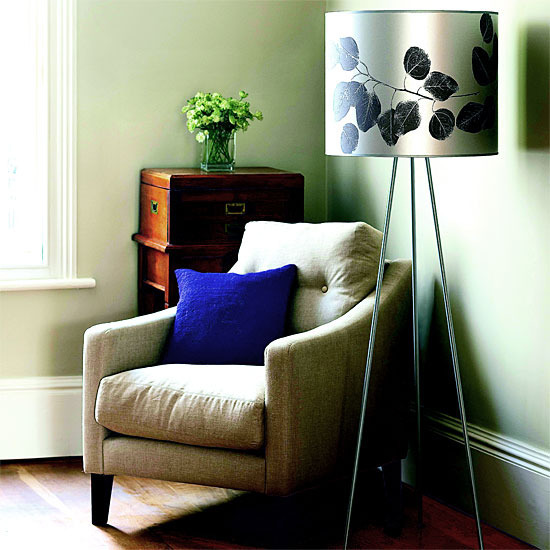 Set against a plain backdrop the lamp creates a decorative focal point in a simply furnished room. 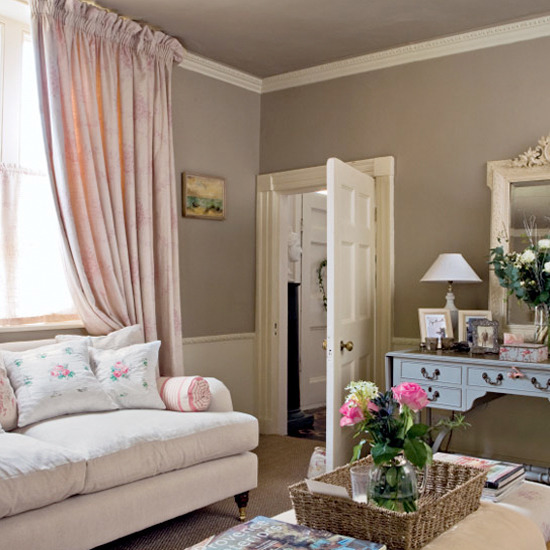 Blend a mix of duck egg and taupe in your living room for a look that’s restful and easy to live with. A luxe floral print at the window is mixed with cushions in a modern grid fabric to keep the look from being too feminine. A starburst mirror and shiny accessories provide contemporary glamour. Create a relaxed yet tailored look in your home study by using natural fabrics and mix checks and stripes with a soft, old-fashioned floral in toning shades. Rustic accessories like this twig lamp stand provide textural contrast, while the Soane leather chair has a very masculine feel. Keep the room clutter-free with a tall bookcase and a woven basket for newspapers and magazines. A textured nature-inspired wallpaper creates a fresh Spring look in this living room, and is combined with modern furniture and wooden accessories to create a natural feel. 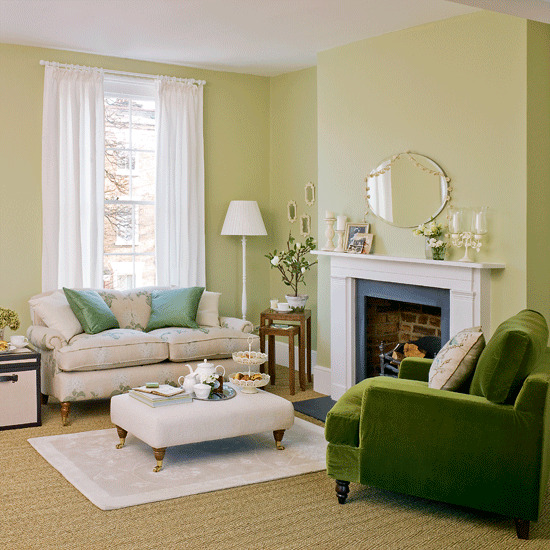 Highlights of green, as seen in the cushions and vases, give this neutral scheme a lift. Accessories and fabrics in shades of duck-egg blue, taupe and pearl keep this living room scheme looking pretty and fresh. 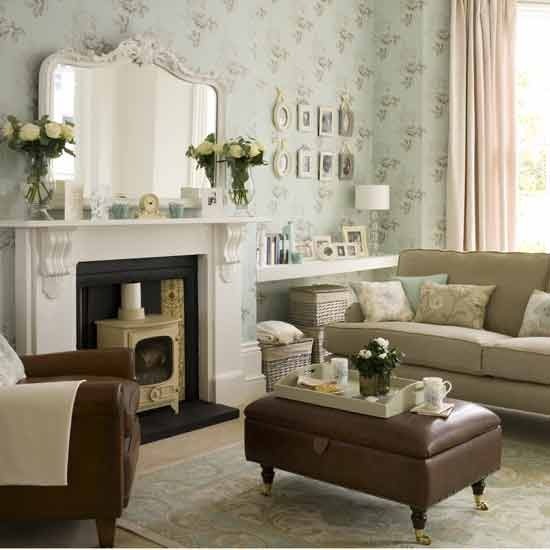 A faded floral wallpaper is teamed with classic-style furniture to create a vintage feel, while a traditional fireplace with a delicately detailed large mirror becomes an eye-catching focal point. Patterns in chalky, faded colours are reminiscent of a Provençal salon. 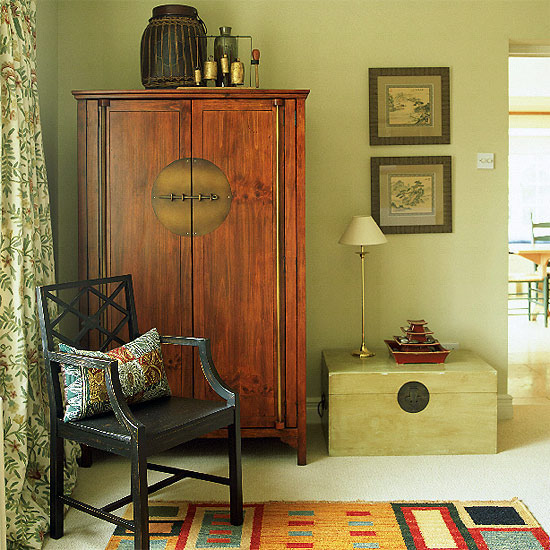 Team painted furniture, such as this armoire from Oka, with crisp linens and introduce French-style soft furnishings, like bolster cushions, quilted throws and layered tablecloths. 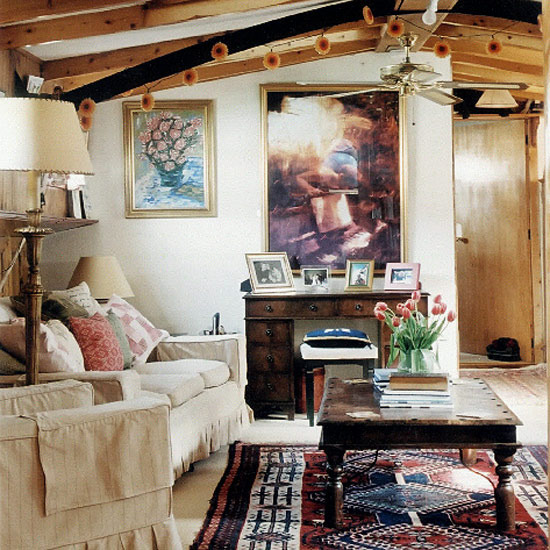 This souvenir-filled living room, bursting with luxurious colourful fabrics, has a lived-in feel. The blue draped curtains from Colefax & Fowler take full advantage of the high ceilings, and the yellow-striped wallpaper is from Osborne & Little. 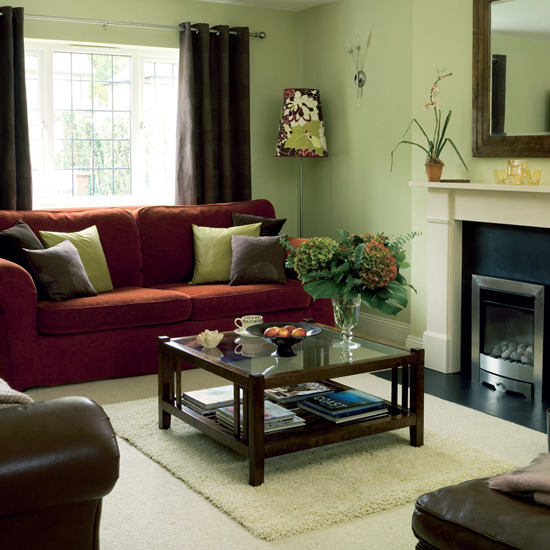 A rich mix of chocolate brown, rusty red and fresh green gives this living room a warm and relaxed feel. Bold pattern is introduced in the accessories for a focal point, while layers of cosy textures adorn the sofas for extra comfort. A room with a classic sofa from the Sofa Workshop and cream walls is transformed with striped curtains and patterned cushions. The dark-wood coffee table from Laura Ashley also adds to the mix of traditional and contemporary touches. 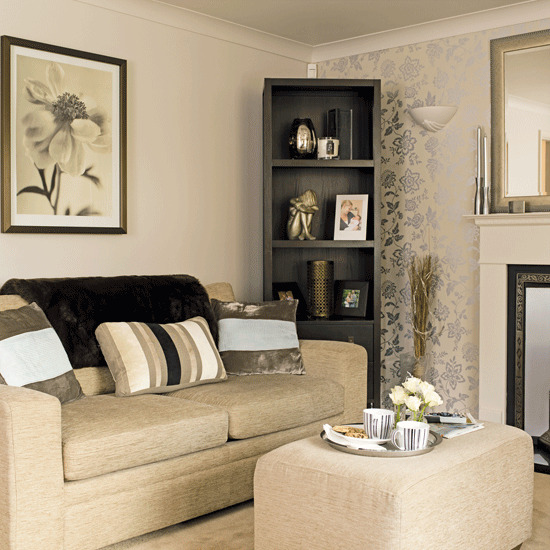 A bright contemporary colour scheme is perfect for a living room. 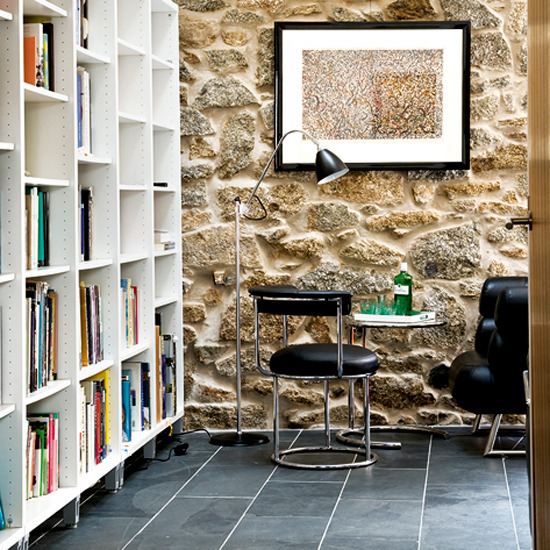 Opt for pale-orange walls, complemented by dark-leather chairs from Raft. The striped footstool from HomeHeaven really adds to the warming tones and is covered in fabric from Parkertex. This 1960s terrace is given a modern feel in the living area. Laminate flooring provides a clean backdrop for the leather suite and striking rug from Ikea. This is finished off with softening cushions and throws from House of Fraser. 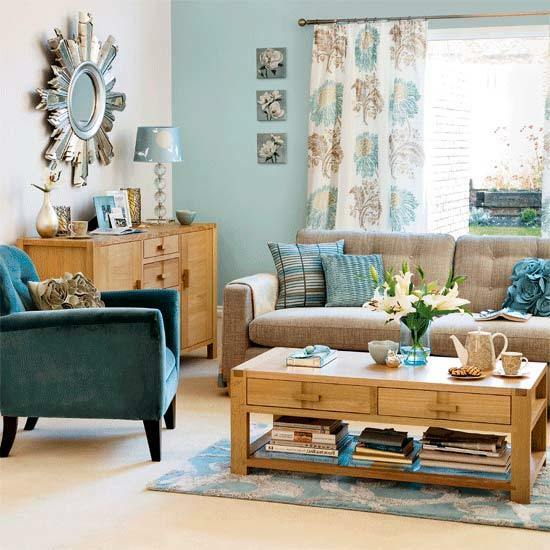 Introduce fresh shades of colour to a neutral scheme by introducing aqua and green cushions from Asda, set against a plain sofa from Argos. The light green curtains are from Osborne & Little and the coffee table is from Ikea. The drawing/living room has a refined feel with walls painted in a creamy white and a traditional chair covered in a striking geometric pattern. This media living room has been designed with a desire for a clear structure, with geometric rug from Beales, which complements the cream wool carpet from John Lewis. This is a clever use of a media room as a multi-media unit for the computer is neatly hidden away. Set against a neutral colour scheme, this ornate antique mirror blends seamlessly with a modern coffee table by William Yeoward. 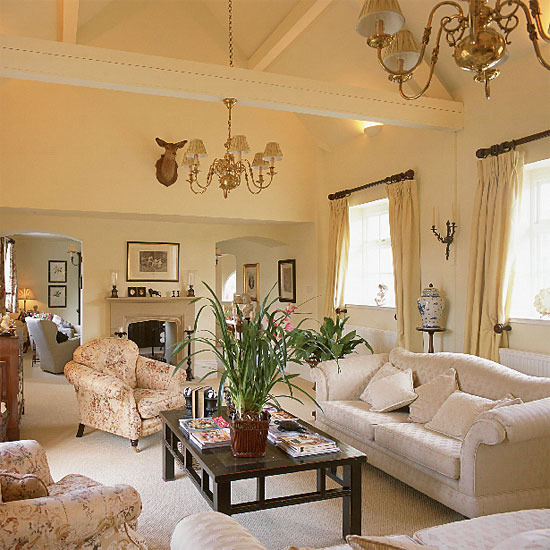 Silk curtains from Colefax and Fowler add a luxurious feel to the room, perfectly complementing the Dudgeon sofa and chairs. Chandeliers from Willowpool Architectural Reclamation hang from exposed beams in the living room of this former coach house. 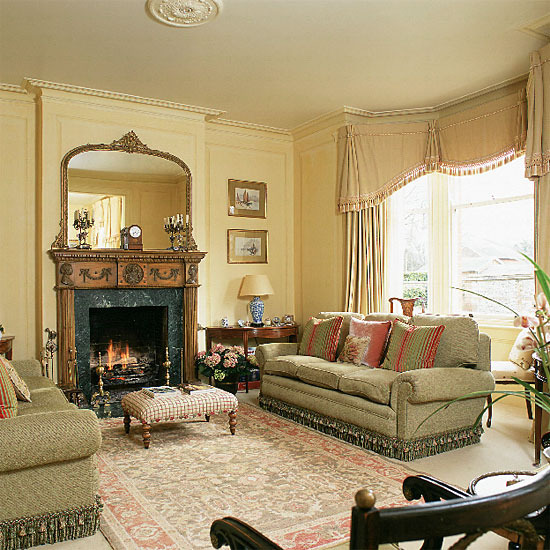 A fireplace set in the dividing wall means it can be enjoyed from both ends of the long room. Seating from Gregory & Porritt complements the Zoffany cream-painted walls and cream silk curtains from The Curtain Exchange. 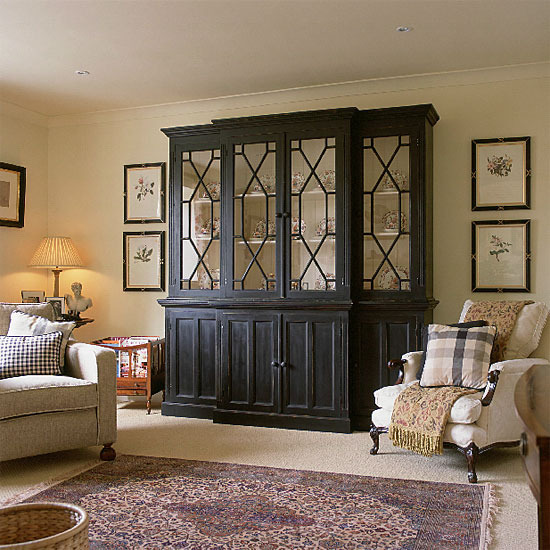 An elegant glass-fronted dresser from McLaren Antiques is a centrepiece of this tastefully decorated living room. 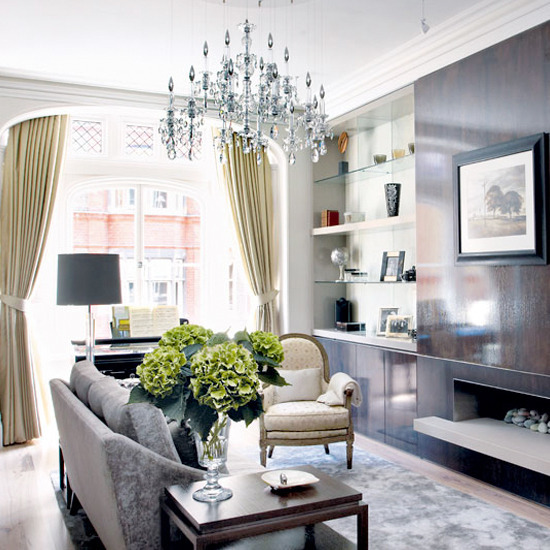 The deep brown tones provide an accent colour mirrored in the furniture, cushions, lamps and picture frames. 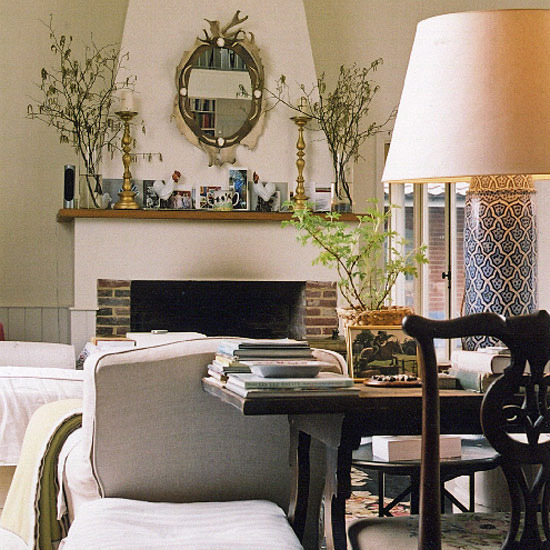 Cream walls and accessories create a light, traditional living room. 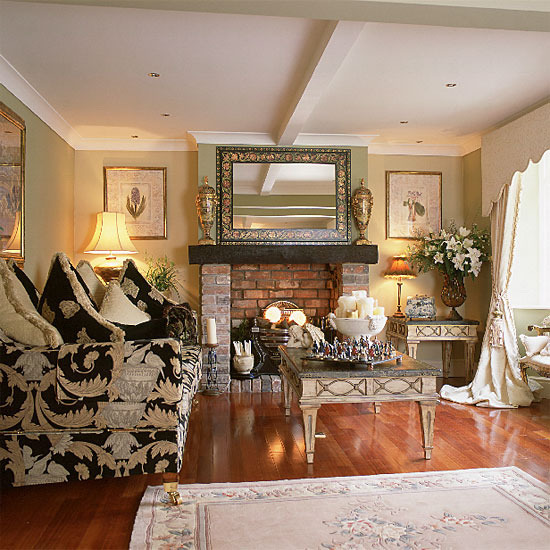 Linen-covered sofas are grouped around a centrepiece fireplace decorated with flowers, candles and china. An ornate oval gilded mirror above reflects light. A traditional polished dark wood table and chairs add contrast and warmth, while a footstool has striped covers from The Volga Linen Company. This living room shimmers with brass effects and highly polished wood floors. The smooth olive walls are highlighted to dramatic effect by a series of well-placed lamps. The Versace fabric-covered sofa, bought at Fenwick, and granite-topped coffee and console tables, fit perfectly into the opulent scheme. 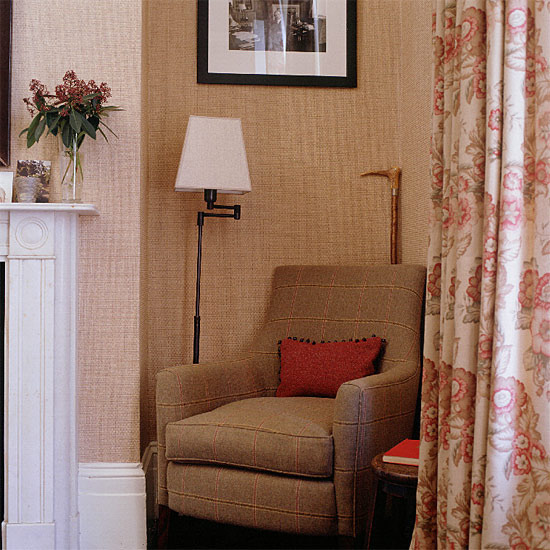 Hessian-backed wallpaper from Turnell & Gigon creates a cosy corner in this study. 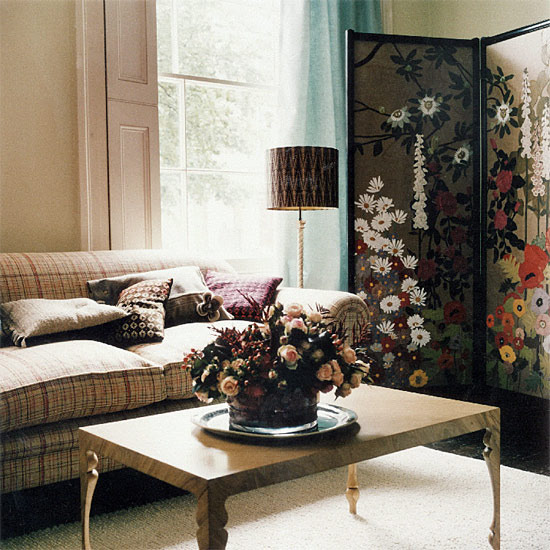 Mixing checks and florals on upholstery and Ralph Lauren curtains adds colour and interest. A simple geometric standard lamp from Mr Light provides a relaxing place to read. 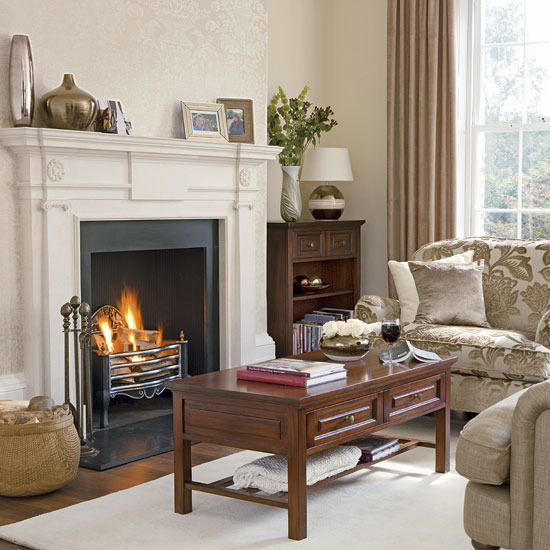 Soft tones and an ornate fireplace give this living room a warm and homely feel. 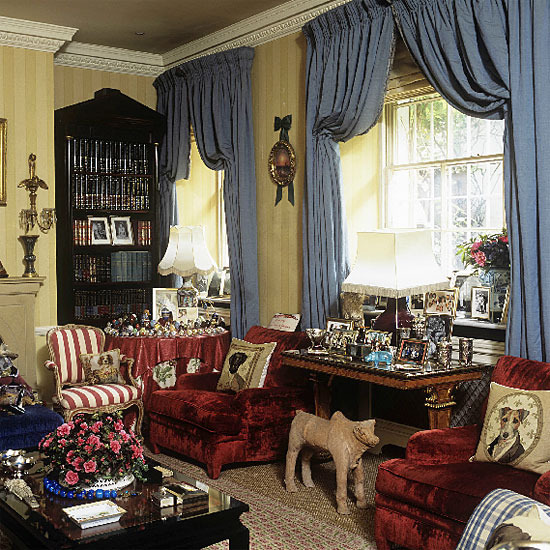 The walls feature trompe l'oeil panelling (a three-dimensional painting technique) by specialist Christopher Boulter, and the twin green sofas have cushions in contrasting Zoffany fabrics. This houseboat living room is a cosy as any on dry land. Keeping furnishings, walls and flooring neutral makes a focal point of the artwork and rugs. Colour is used to create interest in this living room. 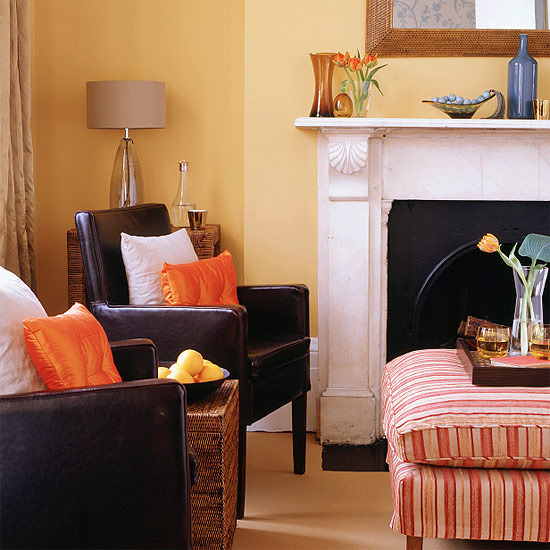 A yellow Burley armchair makes a dramatic focal point against a brown wall and blue sisal flooring adds further contrast. The Nina Campbell black ash table lends a subtly sophisticated feel and displays favourite accessories. Cushions in a spectrum of brown and burnt orange tones bring out the warmth of the walnut coffee table. The silvery-beige colours in the carpet and curtains add a pleasing contrast. Mixing traditional patterned textiles and wallpaper with ethnic touches, like Buddha heads and dark-wood furniture, establishes a living room with a grown-up feel. Choose filigree fittings designed with curling elegance, such as these rustic iron wall sconces, decorative fire guard and ornate mirror. 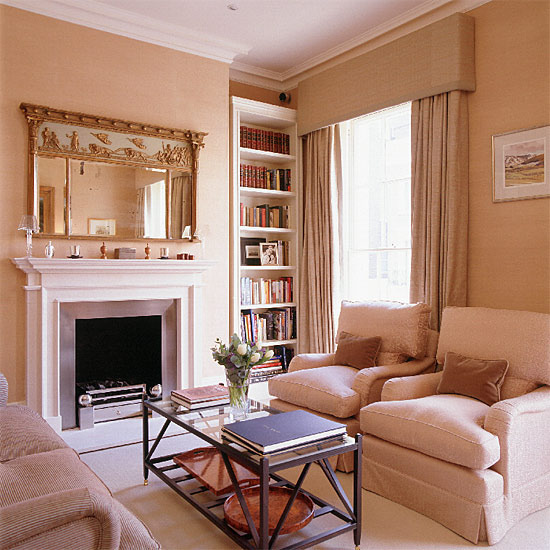 Variations on a similar neutral tone draw together all aspects of this traditional living room - from the furniture to the soft furnishings - to ensure a coherent scheme. Cream and neutral flooring, walls and furnishings create a calm living room area and highlight a treasured oil painting. A Habitat sofa provides inviting seating. 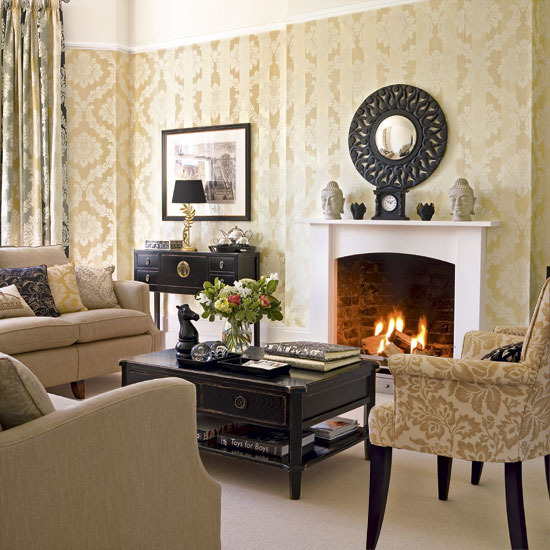 Subtle cream wallpaper highlights the fireplace while gold and dark brown accessories provide warmth. Metallic accessories and textured cushions finish off the look. 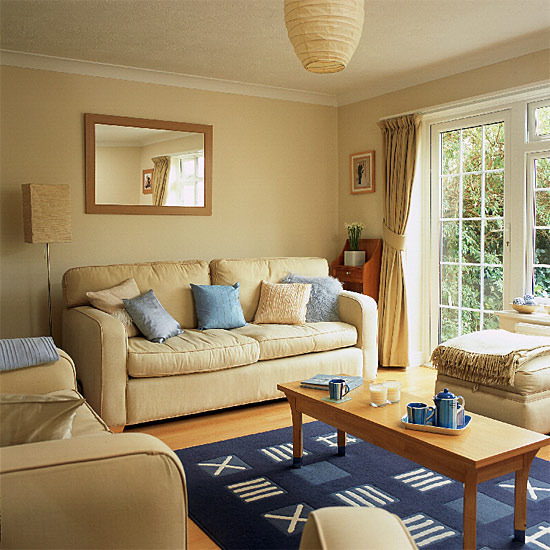 Where can i find the wavy curtains from the global-style living room? If you're like the vast majority of homeowners, you're steadily paying down your home and finding ways to improve on your investment. For most of us, our home is our largest investment. 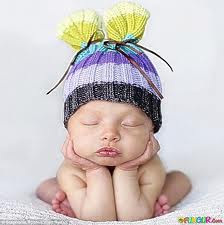 Home is the place where we live and love and where we welcome friends and family. Home is the place that reflects who we are and what we're about.